The hiatus is an opening in the diaphragm (a muscle separating the abdomen and chest) that the esophagus, or swallowing tube, passes through to reach the stomach. 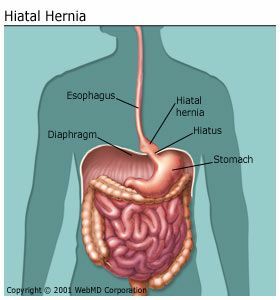 If the hiatus weakens and stretches, part of the stomach can squeeze into the chest cavity, producing a hiatal hernia. In a sliding hiatal hernia, the junction where the stomach and the esophagus meets slides up into the chest through the hiatus. This is the more common type of hernia. Generally, sliding hiatal hernias pose no threat to a person's health unless he or she develops symptoms of GERD, gastrointestinal reflux disease. Paraesophageal hernias are less common but are more cause for concern. The junction of the esophagus and stomach stays in its normal locations, but part of the stomach squeezes through the hiatus, landing it next to the esophagus. Although you can have this type of hernia without any symptoms, the danger is that the stomach can become "strangled," or have its blood supply shut off. Most of the time, the cause of a hiatal hernia is not known. Some people develop a hiatal hernia after sustaining an injury to the chest or abdomen; others are born with a predisposition to the condition. Some experts suspect that increased pressure in the abdomen from coughing, straining during bowel movements, pregnancy and delivery, or substantial weight gain may contribute to the development of a hiatal hernia.